This was my first experience with rice pudding, and I must admit, I was a bit unsure if I would like it. However, Hubby is a lifelong fan of cream of wheat and oatmeal (me, not so much), so when he discovered what I was making, he was excited to try a dessert version. Let’s just say, my pans and spoons were licked clean. In my opinion, there is no comparison between this pudding and cream of wheat. 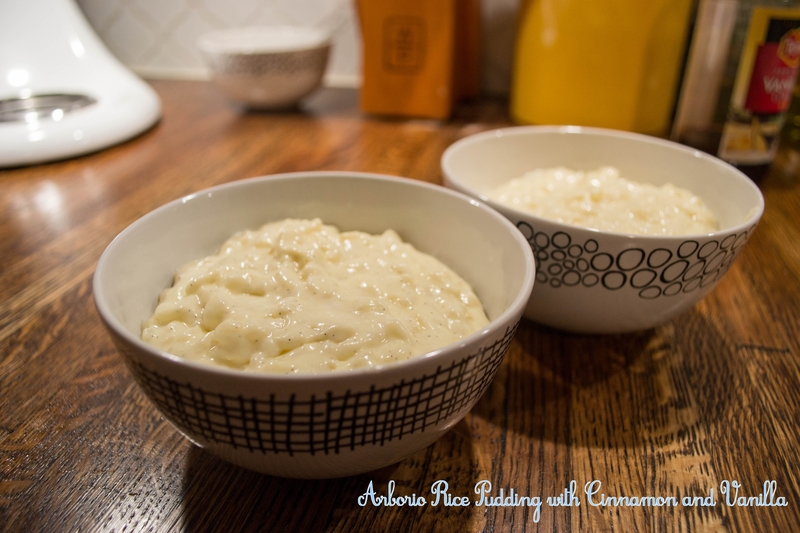 This rice pudding was sweet, creamy and delicious. The flavor is very similar to creme brulee, which I love. It’s easy to make, but requires a bit of time and attentive stirring, so I recommend turning on an episode or two of your favorite show (I watched Amazing Race, thank you Hulu+) to keep you entertained while you stir. I highly recommend trying this out, it was a great way to end a very long day. It is a good dessert that doesn’t require the oven, so if it’s too hot to bake, or if your husband is baking a lawnmower part in your oven (this is my life…you can’t make this stuff up), this treat is for you. Split the vanilla bean in half lengthwise and scrape out the seeds with the tip of a paring knife, reserving both the scrapings and the pod. To make the creme anglaise, combine the cream, milk, and sugar in a small saucepan. Place the saucepan over medium-high heat and scald (just below the boiling point until it begins to steam and small bubbles appear around the edge), stirring to dissolve the sugar. Meanwhile, put the egg yolks in a bowl, add the vanilla bean scrapings, and whisk until pale yellow. Gradually add a ladle of the scalded cream mixture to the yolks while whisking to combine and warm the yolks. Pour the tempered yolks into the saucepan and return to medium heat, stirring until the mixture is thick enough to coat the back of a spoon, which will only take 2 or 3 minutes for this small quantity of creme anglaise. Immediately pour the creme anglaise through a fine-mesh sieve into a bowl. Set the bowl inside a larger bowl of ice water and stir occasionally until cooled. Cover the bowl and refrigerate the creme anglaise while you are cooking the rice. To cook the rice, combine the milk, sugar, vanilla bean pod, cinnamon stick, rice and salt in a saucepan and bring to a boil over medium-high heat; then lower the heat so the mixture is at a gentle simmer. Continue to cook until the rice is soft and the mixture is very thick, 35 to 40 minutes, stirring and adjusting the heat as needed. As the milk cooks down you will need to stir more frequently to keep the mixture from sticking; stir constantly during the last 4 to 5 minutes of cooking. 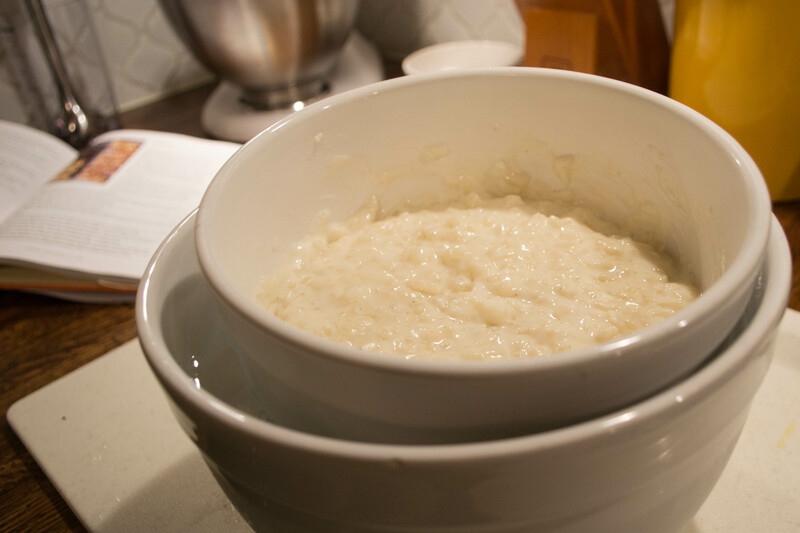 When the rice mixture is soft and thick, transfer it to a bowl. 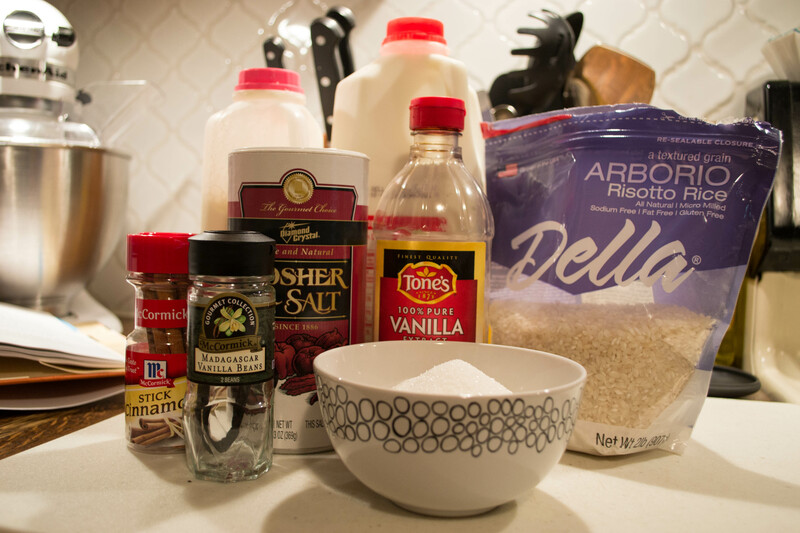 Remove the vanilla pod and cinnamon stick and discard. Place the bowl inside a larger bowl of ice water and stir ocassionally until cool. When the rice is cool, remove the bowl from the ice bath and stir in the chilled creme anglaise. To finish the pudding, put the 1/3 cup cream and the vanilla extract in the bowl of an electric mixture and whip to medium peaks. Fold the whipped cream into the pudding. Serve the rice pudding immediately ot cover and chill for an hour or two before serving. For the best texture, don’t chill the rice pudding much longer because the rice will eventually harden. When you are ready to serve the rice pudding, spoon it into 6 dessert bowls, dividing it evenly. 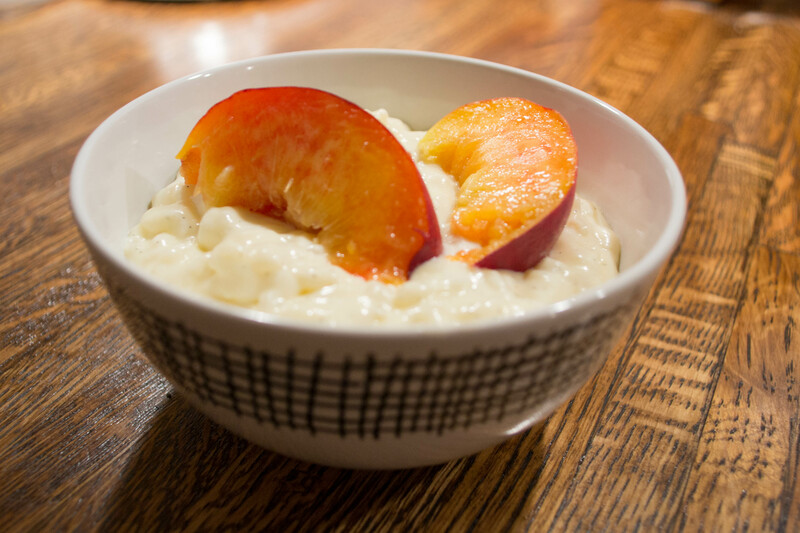 Top each serving of pudding with sliced fresh peaches, or topping of your choice.